First and foremost, if you go anywhere in Spain, GO TO SEVILLE. It’s everything you’ve ever hoped for in a Spanish city – culture, cuisine, great architecture, nice people, and a history you can get sucked into. Lauren and I arrived by bus in the afternoon, and saw people immediately rushing to the streets for Semana Santa precessions. 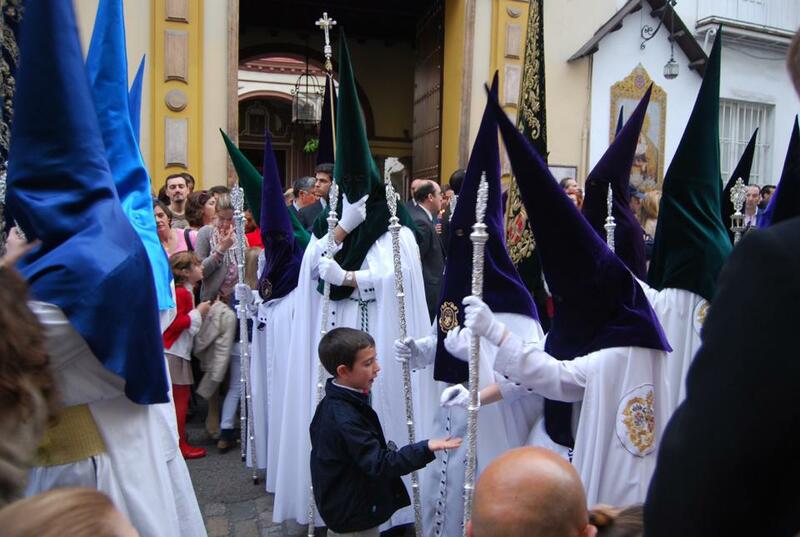 Semana Santa is passionately celebrated in this city, where people dress up to honor the resurrection of Jesus Christ. Sevillians spend all year preparing for this holy week, and we were lucky to see just a small part of it. People lined the streets and waited for hours for the ceremony to begin. Floats and groups of people in religious hoods slowly made their way through the winding cobblestone streets, dripping wax from long lit candles. The wax stained the streets for the remainder of our stay a religious and cultural reminder of Semana Santa. A child getting candy from one of the Sevillans. This entry was posted in Adventure, Budget Friendly, Lifestyle, Travel and tagged andalucia, backpack, backpacking, college, easter, europe, female traveler, holy week, no8do, plaza de espana, semana santa, seville, spain, travel on May 16, 2013 by chantae.